This 275W Sunshine Solar Power Narrowboat Kit offers outstanding performance and great value for money. With this 275 Watt solar power kit you could expect to generate around 91 amps per day (12V Battery System) or 46 amps per day (24V Battery System) during the summer months supplementing the leisure battery power onboard. This Sunshine Solar Narrowboat Kit can be used to charge and maintain 12 volt or 24 volt battery banks. To make the most of the MPPT solar charge controller included with this kit and for you to maximise the solar power generated, this kit is designed so the solar panels are linked in series increasing voltage and therefore increasing the efficiency of PV modules by 10% to 30%, in short making the most of the daylight hours. Sunshine Solar's range of rigid solar panels are built to last with 10 Years Warranty on Materials & Workmanship and guaranteed output performance of 25 years plus this is the range to fit and forget. Whether you are on a livaboard boat or day cruising if you are looking for many years of maintenance free solar power generation the Sunshine Solar Narrowboat Kits will not disappoint. Save Money..... Don't forget you can save money on add-ons to compliment your solar kit such as the Remote Meter, not only does this give you valuable data about the overall performance of your solar panel it also gives you info on your battery state of charge and makes setting up your system easier. You may also wish to add some Bostik-360 Fixing Adhesive at a reduced price for bonding the roof mounts and cable entry cover. 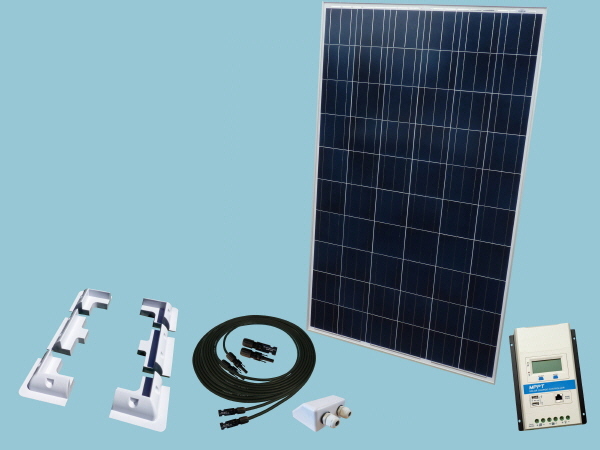 Important note: The solar panel needs a flat area of 1111mm x 1770mm these dimensions include the corner and side mounts supplied with the kit.